As soon as my plane touched down in Kuala Lumpur I became an idiot again. I’d just started feeling a tiny bit competent at handling basic tasks in the Philippines, and all it took was a short flight to send me right back to square one. Entering a new country for the first time is humbling. There’s a lot to figure out: money, transportation, what to see and do, how to communicate, where to sleep, cultural norms, the local cuisine. And yet my first visit to a country is almost always my favorite, despite the fact that being so ignorant makes me frustrated and anxious. The thrill of experiencing a new place for the first time eventually tops the discomfort that always accompanies it, and the sense of accomplishment that comes from figuring things out is probably part of what makes the initial visit so enjoyable. From the Kuala Lumpur airport I rode a light rail train to the city center, checked into my hotel, and went for a walk. Malaysia is at an entirely different level of development than the Philippines. Kuala Lumpur felt less like Manila and more like Singapore, with modern skyscrapers, upscale shopping malls, and fancy new cars on reasonably well maintained roads. The country, officially Muslim, is really a mix of religions and cultures. The biggest groups are the Malays, Chinese, and Indians, with a sprinkling of everyone else. That night I had my first experience with Malaysia’s sprawling street food hawker stalls. 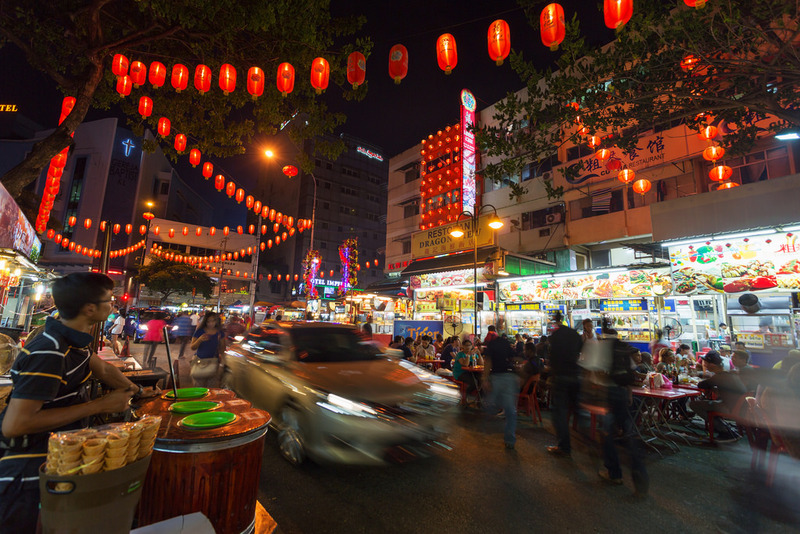 I ate some great Chinese food and drank Tiger beer with diverse crowds of people at the plastic tables that filled Jalan Alor in the Golden Triangle neighborhood. The next day I explored more of the city. 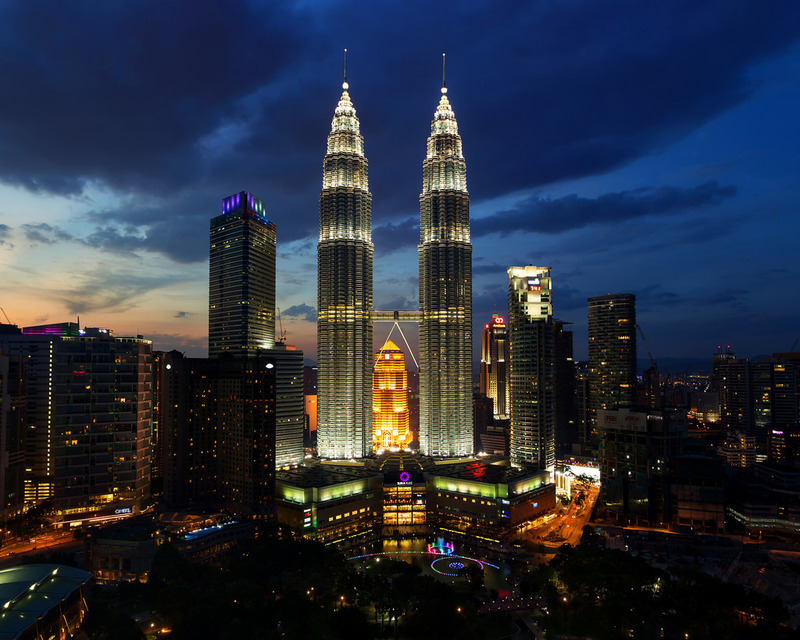 As sunset approached I made my way to Skybar on the 33rd floor of the Traders Hotel, which has arguably the best view of Kuala Lumpur’s famous Petronas Twin Towers. I loved it. A clichéd shot of a city’s most iconic landmark is right in my wheelhouse. He walked me back outside and called over another guy, who also told me I needed to go to TBS. The second guy and a couple of his buddies then directed me across the street to a woman behind a counter who tried to sell me a bus ticket to Penang. “Where does the bus leave from?” I asked. At the time I thought she said 50 minutes but later realized she’d probably said 15. She also quoted a price that sounded too high. “No,” I snapped at her irritably, still not convinced that my initial information had been wrong. I didn’t trust her or the guys who’d sent me there and wasn’t sure of my next move. A nearby hotel seemed like a potential source of unbiased advice. Sweat dripping from my face, I asked the front desk clerk if any buses to Penang left from the station across the street. “No,” he said. “You must go to TBS.” TBS, he explained, was Terminal Bersepadu Selatan, a bigger bus station about 15 minutes away on light rail. He pulled out a map of the rail system and showed me how to get there. I had to accept that my hotel had given me bad information after all, and the people I thought might be scamming me were trying to be helpful. Feeling foolish but finally set straight, I rode the light rail to TBS, where a centralized ticketing system made it easy to book a seat on a bus that left for Penang within the hour. By 4pm I was there. The process of figuring out a new place isn’t always smooth, but with each mistake I become a little less ignorant. More importantly, given that I’m posting this on April 4th I want to wish my mom a Happy Birthday!